Brady’s non-adhesive, printable heat shrink wire marking sleeves fit around wires or cables for maximum insulation protection and permanent identification. Brady’s heat shrink sleeving is a full-circle design that provides fast and permanent wire marking. Clear, legible text can be printed on the wire and cable sleeving with a Brady printer for reliable wire identification. Brady heat shrink sleeving materials excel in extreme environments, including temperature fluctuations and environments that require abrasion and chemical resistance. Brady offers a variety of materials available to print using thermal transfer and dot matrix printers. B-342 3:1 heat shinkable sleeves for wire identification and insulation purposes are fade resistant and fire retardant. B-342 is available in white, yellow, black, red, orange, green, blue, violet, pink, gray, and brown. Shrink Method: Any industrial grade heat gun may be used to shrink B-342 Markers. Thermal transfer ribbons are only needed for labels that do not have self-contained print ribbons. UL: B-342 is a UL Recognized Component to UL224 Extruded Insulated Tubing. See UL file E333786 for specific details. UL information can be accessed on line at UL.com. Search in Certifications area. RoHS 2005/618/EC: As of January 2009, Brady began the transition to full RoHS compliant B-342 to 2005/618/EC MCV amendment to RoHS Directive 2002/95/EC. To determine if you have RoHS compliant product please contact customer service. SAE: B-342 PermaSleeve Markers meet the material and physical property requirements of SAE AMS-DTL-23053/5C (Class 1) for Insulation Sleeving and SAE AS-81531 for Marking of Electrical Insulating Materials when printed with R6600, R4300, R4502S, R6700 Series thermal transfer ribbons and R5000 Series dot matrix. Brady manufactures signs, labels, lockout tagout solutions, safety devices, industrial label printers, software, and spill control used to comply with regulatory standards in electronics, telecommunications, manufacturing, electrical, construction, education, and medical industries. The company, founded in 1914, is headquartered in Milwaukee, WI. 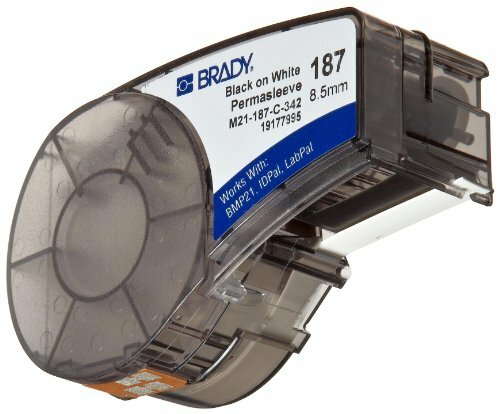 Visit the Brady Label Finder Store to find labels for your printer. Made from Brady's B-342 Polyolefin PermaSleeve Marker material, a non-adhesive, heat-shrinking sleeve that fits around wires or cables for insulation and easy permanent identification. 3:1 heat-shrinking wire marking sleeve is ideal for labeling in harsh environments and is resistant to exposure to chemicals, grease, oil, and cleaning agents. Polyolefin wire marking sleeves print in black text on a white background with a smudge-proof finish. Compatible with the BMP21-PLUS or ID PAL label printers, permasleeve wire labels are an indispensable asset for electrical contractors, maintenance crews, construction teams, and industrial professionals.